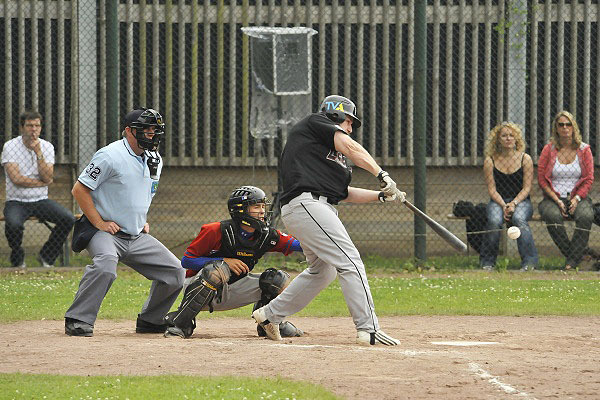 One day before both teams meet at the Armin Wolf Arena in Regensburg, the Buchbinder Legionaere announced on Thursday morning that first baseman/outfielder Michael Weigl (picture) is leaving the club to join the Heidenheim Heidekoepfe for the 2010 season in the Baseball-Bundesliga. He already is eligible to play this weekend. During the winter Regensburg had revealed that there is no room left for Weigl on the 1st team roster. Until last weekend though, it looked like as if he still stays within the organization, playing for the third team. The Heidekoepfe had asked the Buchbinder Legionaere about a transfer at the beginning of the week. Born in Regensburg, Weigl is 28 years old and a left-handed batter. He made his Baseball-Bundesliga debut at the age of 18 for the Legionaere in 2000. He also played for the Baldham Boars (2002) and the Fuerth Pirates (2003-2005) in the German elite league. In 203 career games he has a .327 batting average (OBP .400/SLG .457) with seven homeruns, 120 runs and 107 RBI.